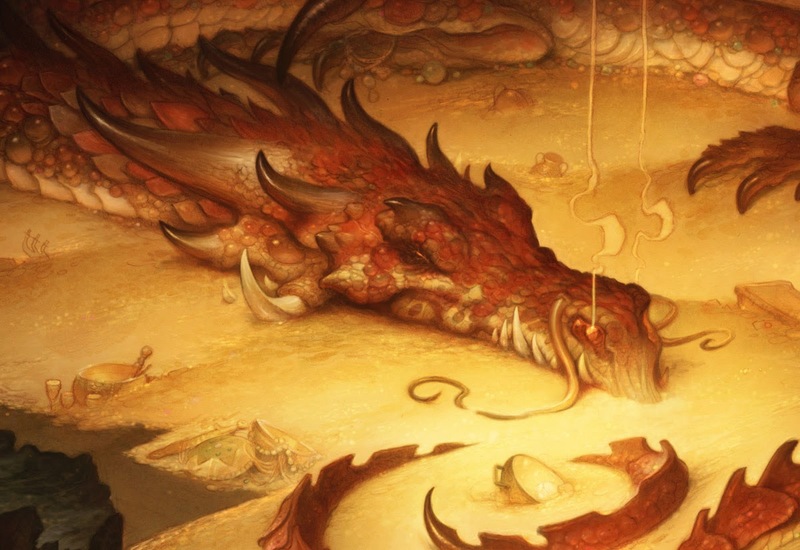 I think a good fantasy story, (and I mean fantasy as distinct from science fiction or any other category of fiction) should make us want to look at our actual world from a new perspective. While a poor fantasy story will make us bored with, and disinterested in, our actual world. There are other elements necessary to good fantasy stories of course, but I feel like this is an integral one. Good fantasy, wether it is writing, film, artwork, a game, or whatever, should make us want to explore and become more curious about the world we live in. While the second Hobbit film disappointed me as a Tolkien story, I really enjoyed it as a fantasy story. The film, with its amazing landscapes and powerful vistas, made me want to get out and explore the world. The treks over mountains made me want to go backpacking. The barrel-riding scenes made me want to go kayaking. Smaug's lair made me want to hop some fences and do some urban exploring in that old abandoned chemical plant down the highway. This same idea applies to representational art for me as well. There is a great deal of naturalist art, which borders on the fantastic. And it has much the same effect on me. 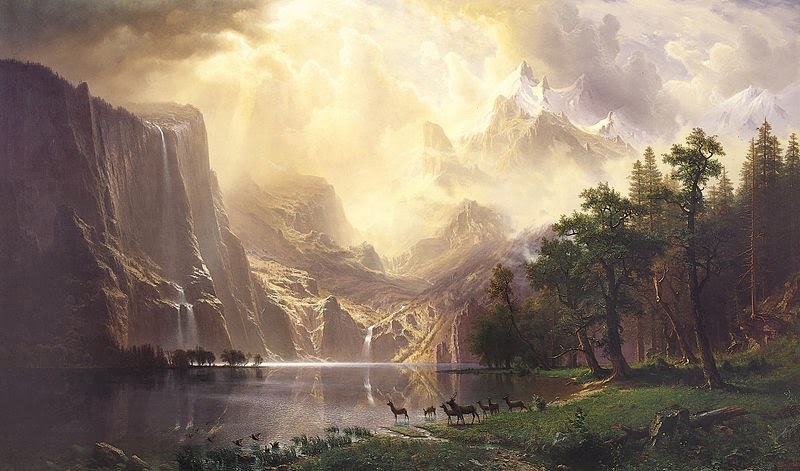 Thomas Moran and Albert Beirstadt’s work, while being that of naturalists recording the world around them, also has elements of the fantastic in them. The images are transportive, and they capture something beyond that of photography, something sublime, a momentary glimpse into eternity. Their paintings are scenes born in the American wilderness, but they are often an amalgamation of different places and times of day, combined together to capture the essence of a place. They give a sense of the wonder and grandeur found outside our own fences. 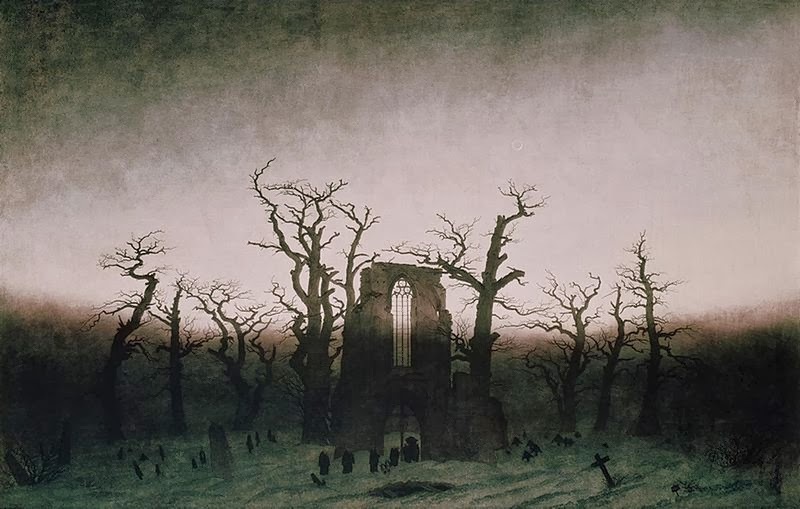 Caspar David Friedrich’s gorgeous and haunting chapel scenes stretch even further. They instill a desire to visit ruins and learn about the people who made them and why their works have fallen. But Friedrich’s visions take it a step further, somehow making us also consider our own life’s eventual twilight. Like the Hobbit film, these naturalist painters put in me a desire to escape my safe, suburban life for a while and see what is out there in the wilderness over the hills. And I think that is pretty great.